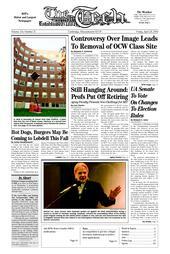 CORRECTION TO THIS ARTICLE: A front-page article on Friday, “Controversy Over Image Leads To Removal of OpenCourseWare Class Site,” was incomplete in its portrayal of the views of the Chinese students, many of whom wanted the sensitive material on the site introduced with better context, rather than removed altogether. Additionally, it incorrectly gave the first name of a professor who co-created the class — he is Shigeru Miyagawa. The history professor quoted in the article is Peter C. Perdue, not Peter Purdue. In response to complaints of cultural insensitivity from members of the MIT community, the Institute has removed an entire OpenCourseWare class linked from a featured spotlight article on MIT’s main Web page. The controversy explores the question of whether Institutions should censor potentially offensive material that can be easily circulated out of context. The Web site for the class, “Visualizing Cultures,” taught by Pulitzer Prize winner and history professor John W. Dower, came under fire after browsers found historical images depicting the execution of Chinese prisoners by Japanese soldiers. The site, which was linked from the spotlight article which ran all day Sunday and Monday, was removed after MIT officials received e-mails Monday morning saying that the controversial images, presented in one section of the site, were hurtful to the Chinese community. Professor Sugimoto Miyagawa, co-creator of the Visualizing Cultures class, has received a large number of explicit hate mail and death threat messages via e-mail since the spotlight’s debut. Miyagawa’s e-mail address and telephone number appeared as the sole contact information on the Visualizing Cultures Web site, although Dower was the exclusive author of the content. On campus, the dispute has quickly escalated, leading to a public forum on the issue held this past Wednesday. The images in question, particularly a woodblock print from the Sino-Japanese war depicting Japanese soldiers executing a group of Chinese prisoners, were included in a unit titled “Throwing Off Asia” describing the period of time when Japan decided to westernize and throw off its Asian identity. “I thought that image was the most ghastly image of Japanese atrocity imaginable,” said Dower during Wednesday’s packed discussion meeting to determine a proper course of action following the Web site’s removal. “I’m shocked that the single picture that we are presenting as an atrocity be ripped out of context and identified” as an endorsement of the images by MIT. The Visualizing Cultures course, which focuses on war, racism, propaganda, and atrocity, won an award from the National Endowment for the Humanities and contains six units of text authored by Dower, along with 1000 to 1500 images. “The spotlight featured a series of postcards from the era of the collection, none of which depict war,” said Suzana Lisanti, MIT home page coordinator who along with MIT administrators met displeased students Tuesday night. “They were images of people riding bicycles and reading the newspaper.” The spotlight can be found online at http://www.blackshipsandsamurai.com/spotlight/vc_spotlight.html. The controversy came when the images, which have been online since the course’s introduction in 2003, began to be circulated out of context on the Internet. “They were posted on messages boards with just the URL or picture,” said Sugimoto. Since the original Web site was taken down from MIT’s servers, it was difficult to determine in what original context the pictures had been presented. The forum held Wednesday evening to allow people to voice opinions about the Visualizing Cultures course was packed with students, professors, and members of the Chinese community from MIT, Harvard, and around the world. After all in attendance were allowed to speak, Miyagawa and Dower made short replies. “The point historians try to make is that to display something is not to endorse it,” said Peter Purdue, who taught Chinese history for 25 years at MIT and was present at the discussion. Purdue was verbally badgered as he left the room after suggesting that the Visualizing Cultures Web site be placed back online without an apology but including a comments section for people to share their thoughts and ideas. MIT officials are now determining what steps to take before the Web site is returned to the internet. “The homepage brought it to the attention of such a wide audience that we have to think about how it will be interpreted,” said Lisanti. Possible suggestions include providing captions in several languages or an overlay on each photo with a disclaimer, she said. According to a statement issued by Huan Zhang G on behalf of the Chinese Student and Scholar Association, a forum to facilitate discussion of the imagery is being organized by the Committee on Campus Race Relations for early May. The statements released by MIT and Professors Miyagawa and Dower are included with this article.